Above: Megan Mullally, Eric McCormack, Debra Messing, and Sean Hayes. 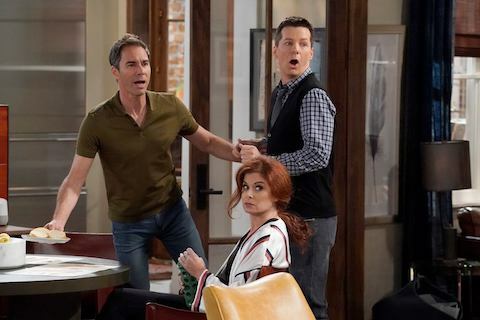 Will & Grace is one of our all-time favorite comedy series, so we were delighted to hear that Eric McCormack is guest-starring on Debra Messing’s series “The Mysteries of Laura.” “Mysteries” didn’t bowl us over in the beginning, but seems to be improving. Eric, whose TNT show “Perception” was cancelled, will play an arrogant surgeon whose wife is murdered. He also happens to be Laura’s ex-boyfriend, and Laura is in charge of the investigation. (Is that ethical?) Anyway, we love the idea of seeing them together again. 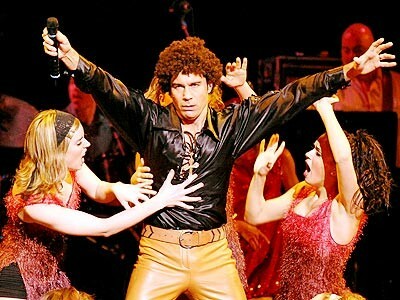 Quick – guess who this guy in the disco outfit is: No, it’s NOT Will Ferrell – which was OUR first notion. Actually it’s Eric McCormack, performing at a Gilda Radner charity fund raising show in Toronto. We were never aware of any resemblance until Eric sported that 70’s curly wig. A friend visiting New York bumped into Eric McCormack in the street in Greenwich Village and reports that the Will & Grace star looks ” beat to pieces.” ‘ Eric is currently starring off Broadway in Some Girl(s) with Maura Tierney and Fran Drescher and it must be a lot more stressful than his TV series. Our witness reports Eric and his wife with their child in a stroller, were standing in front of The Monster gay bar in the village waiting to cross the street. “Eric’s wife looked great, but Eric was a mess. He wore tan shorts and a faded green t shirt and he looked very thin and pasty. He was unshaven and his hair was grey and messy. He just looked exhausted and overworked. ” His character Will Truman would never have gone out looking like that – which may illustrate what a good actor Eric is.